Continue to Part 2 Days 13 – 24. We are headed back to the Camino Francés for our 3rd time. – We, well probably I, like that there are MORE people on the Camino Frances (CF), than the other 12 Camino paths. – Last year, being our #2 year, we enjoyed the familiar, and also the new and different. We like the combination of BOTH, familiar & new. – And, I like the length of it. We left our house at 9am on SUNDAY, for the San Francisco Airport, and then flew…..
– SF to NY to Paris to Biarritz and then were greeted by Jonathan, our Shuttle Driver from Express Bourricot. We were joined by 5 other Pilgrims, also, just arriving. – It was the BEST route to date, as far as getting directly to St Jean, in one fell swoop. Albeit, we arrived on MONDAY at 7:30pm, 25.5 hours later, plus, a 9 hour time change. We were EXHAUSTED, but/and VERY happy!! – The hour+ drive from Biarritz to St Jean was similar to San Francisco to Santa Cruz. Beautiful mountainous green hills, and curvy roads, arriving to St Jean, a quaint mountain town with cobblestone streets and only pedestrians, no (minimal) cars. – We, like HUNDREDS of other Pilgrims, went to the Pilgrim’s Office to get our Camino Credential (Passport). This is where many begin their Camino to Santiago de Compostela. – What a delightful day!! We walked all over and around St Jean Pied to Port, France. It is an old 1500s French historical town, in the Foothills of the Pyrenees that we plan to Walk over and cross, tomorrow and Thursday. – There are French Tourists; Families and precious children, walking around a 1500+ year-old Citadel/Fort and through the cobblestone streets. – There are dozens and dozens of new arrivals with their backpacks on, talking with excitement and wonder (or is it SCARED) of beginning this ancient old 780 kilometer Pilgrimage across Spain to the Cathedral of Santiago where the remains of St James, the Apostle resides. – I met my first Aussie Camino friend, Julie, from Darwin, Australia. We met on the Australian Facebook Forum and realized we were both Walking to Orisson, for our FIRST day on Wednesday, April 12th. – We went to get something to eat and sat next to 6 Canadians from Niagara Falls, Ontario. They are also excited, along with worried, concerned and curious on how this is going to ALL transpire. – No one knows. We ALL come with the intent to Walk. Some to Santiago, and maybe beyond to Finisterre. Others with less time, Walk to Burgos or Leon, and plan on returning at a later date. Many need to stop for some reason or another; injury, family needs, time runs out, etc. – Tomorrow we start UP a STEEP incline for the first 1/4 of the Walk over the Pyrenees. The next day is the last 1/4 to the top of the Pyrenees and also the final 1/2 of the Walk down to the bottom, to a small town called Roncesvalles. More will be explained in the next two days. – It is 11:30pm and our alarm is set for 6am. Time to go. 3 hours- 2300′ incline: UP!! I didn’t sleep at all last night. Crazy!! But I rested. David figured it was because of the Time Change, 9 hours different from California. Anyway, I prayed and thought how glad I was that our first day to “Orisson” was only 5 miles, 3 hours, albeit a 2300 feet STEEP incline straight UP!! It took us 3 hours to Walk straight UP for 5 miles. We rested when needed and then Walked on, head down, step by step. There were dozens and dozens of Pilgrims leaving between 7am and 8:30am. There were people scattered in front of us, behind us and next to us. It was delightful as we spoke to each other, asking where we were from, etc. Orisson is 1/4th of the Walk up over the Pyrenees to Roncesvalles. Only 40-50 people can stay in Orisson. Dozens & Dozens continue on the 12 miles and 5 hours to Roncesvalles. Some even Walk further. We arrived at about 11am. The Deck and Cafe were filled with Pilgrims getting something to eat before heading on to Roncesvalles or staying the night. Between arriving and 6:30pm dinner we all shower, hand wash clothes, talk to each other, stretch, rest, read, sitting on the deck having a beer, cafe, bite to eat etc. Last year during our 50 Day Camino we met people from 40 different countries. They all chat and get to know each other during the course of our daily walk, our afternoons in the Albergues/Hostals, out shopping, in churches and cathedrals, etc. In 3 days David and I (well, more “I”) have met numerous people from each one of these countries. Australia, Brazil, Canada, England, France, Germany. Holland, Ireland, Italy, South Korea, Spain, United States. In the afternoon, all 40+ of us, were talking and getting to know each other as we waited for our 6:30pm group dinner. The 6:30pm group dinner was delicious homemade Soup, Pork Cutlets, Beans/Carrots, French Bread, Red Wine, Water and delicious Almond Pie. All 40 of us introduced ourselves one by one, laughed, talked and went off to bed, or watch the stars come out. 7:45am: David & headed up the hill, towards the Pyrenees Peak of Leporder. ALL 40+ of us left for Roncesvalles; btw 7:30-8:30am. During the next 8 hours we saw many of our Orisson Camino/Pilgrim friends, on & off, as some slowed down and others sped up. Plus dozens of others that Walked straight up from Orisson and sped past everyone. As each passed, I said, “Buen Camino.” And to many others, I spoke with them for awhile until one of us slowed down, stopped or sped up. 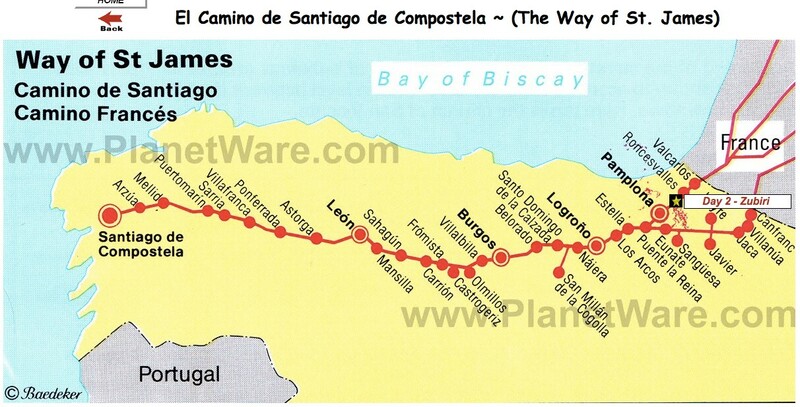 This is how it goes for the 780 kilometers – 450 miles, as we Walk to Santiago. The weather was amazingly beautiful; sunny, clear, not hot, not even windy as in the past 2 years. Walking the same rounded gives us a calmness as of our awareness of difficulty, length and do-ability. 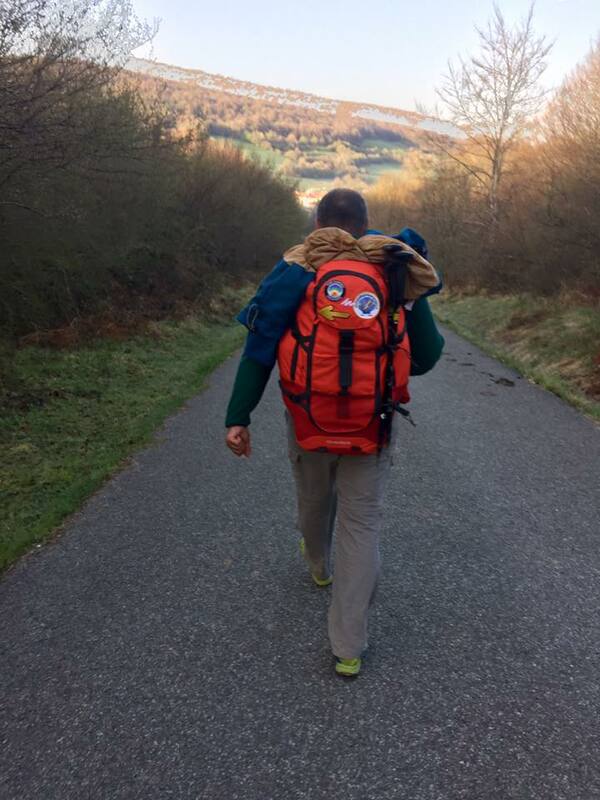 It took us 7+ hours to get to Roncesvalles this year, as David’s knee pain that began a few weeks before the Camino, began to hurt and slow his down. At 2:30pm-ish we stopped at the BIG New Roncesvalles Alberque to rest, figure out what to do about David’s knee pain, and decide if to Walk 2 more miles to Burguete. We saw a number of familiar faces arriving, exhausted and happy!! We headed out to Burguete. It is a pretty, tree lined, flat path. We stayed in a Hostal that Hemingway used to frequent. Hostel Burguete, where Hemingway spent his vacations. Sadly WIFI was sketchy at best, therefore I was now another day behind on Posting an update. David realized his knee couldn’t walk to tomorrow. We made arrangements for him to take a taxi in the morning, while I walked to the next town, Zubiri. Poor david!! At 7:30am I kissed David goodbye at the Burguete Hostal as Pilgrims were walking by, heading out for another day on the Camino. David’s knee started hurting a few weeks BEFORE the Camino, because he put on tight high hiking boots to hold his ankle in place from the loose ligaments. His knee did NOT agree with that solution!! obviously. Going to Orisson was doable. Going to Roncesvalles made his knee worse. David will Taxi to Zubiri. Cher, from yesterday, was walking by just as I was saying goodbye. We chatted for a bit, until she stopped to get her “kitty fix,” as she said. It was a nice way to start Day 3. At 8am I met Franco, an Italian man that had on his Backpack “The Camino Provides” patch, as do I. My Northern California Camino friend, Laurie Ferris, designed and created Camino Provides. I was so excited to see it on “his” Backpack. Franco told me his wife found it on the internet and he loved it immediately!! He also said Laurie, the creator, was such a “gentile” and wonderful person to buy from. I excited to tell her. If only I had WIFI!! At 9am Diana, from Holland, and I started walking together as our pace was the same. As we talked she shared how she had lived in “Watsonville,” California for 6 months, 30+ years ago. “Watsonville” is a small agricultural town in Santa Cruz County where I have lived and worked since 1985. On the Camino MANY Pilgrims experience such crazy connections. I am sure MANY of my Camino FB friends would attest to this!! As we were walking Diana convinced me that David and I should visit her in Holland where they ride bicycles EVERYwhere and can even do 10-14 day bike trips, staying in Bed and Breakfasts. Yippee!! Another fun active place to experience!! At 12:45pm Diana and I walked into Zubiri, and David waved us down at an outside Cafe. It was a delightful & wonderful 5 hour walk, visiting and talking with Diane for 3+ hours of it. David found us a private room, after we thought none were to be found on this BUSY Good Friday. But alas, no WIFI again!! David and I discussed his/our plans concerning his knee pain that had started 3 weeks prior to leaving for the Camino, and flared up during our 12 mile walk up and over the Pyrenees yesterday. More to tell, as days go by. My new Holland Camino friend, that had worked 30 years ago, in the small farming town where I work; Watsonville, CA. Franco, waving HOLA to Laurie Ferris, “The Camino Provides” patch designer. At 7:30am I left David at the Zubiri Pension to Walk to Pamplona, as he planned to get a Taxi later in the morning to our Pamplona Hotel. Getting a Private Room in Pamplona on Easter weekend was a near impossibility!! But he found one on “booking” and it is even in the Old part of Pamplona. I am a person that prefers to travel with others, rather than travel alone. I tried traveling to Nosara, Costa Rica (2008) on my own, before David and I met. My girlfriend was supposed to go with me but had to cancel last minute. I walked a lot there, and cried. The same thing happened in a trip to Italy 10 years ago. I am hoping and thinking this will be different. I know the Camino Frances path and I feel very familiar with finding my way on it. Plus, there are many solo Pilgrims. Vamos a ver. At 9:30am, as I was Walking and talking with Phillip, one of the 6 Canadians I met Tuesday night in St Jean, we came upon a Cafe over the bridge called Parada de Zuriain. Last year on the SAME Date I took a photo with the sweet young owner, María José. I walked in and there she was. I showed her the photo, she smiled and we took another one. Next year? At 12pm I arrived to the Bridge and the beginning of Pamplona. – In 2015 David and I went over the Pamplona Bridge as directed by the Yellow Arrows. We Walked through the bustling City of Pamplona, needing to STOP at EVERY Red Light, holding our Pokes in tight because of the crowded sidewalks to the Old part of Pamplona, where the heart of the Camino & Albergues are located. 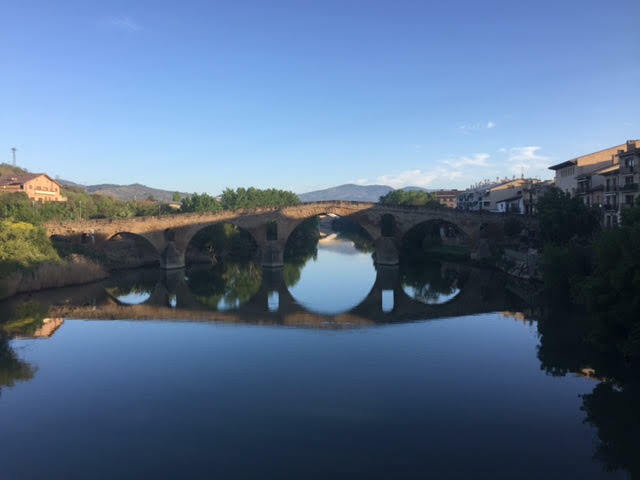 – In 2016 David read about NOT going over the Bridge, but rather staying to the Left of the River and Walking through a tranquil Park with occasional elderly couples walking arm in arm, kids on bikes with parents following, Camino Bikers, etc. – Today, 2017 I did the same with a familiar knowing that the River Walk was much better than through the City, where I got to ENJOY the Pamplona LOCALS during my 4 Kilómetro, 1 hour Walk to the Old City Walls. For this and many other reasons I/we find returning to the Camino Frances a 2nd & 3rd time VERY enjoyable & comforting. At 1pm I Walked through the Wall of the Old Medieval City!! Locals, Spanish Tourists, Foreigner Tourists, Pilgrims -ALL mingling around. -Children, parents, strollers, grandparents, teenagers, couples, etc. At 7:30am I said goodbye to David as I left to Walk to Puente De la Reyna. It felt even stranger than yesterday leaving to Walk without him because now we needed to say “Goodbye” for days or weeks as he Trains to Leon. We made an appointment to see Roberto, El Rey de Fisioterapia. The same Physical Therapist that helped me our first Camino, in 2015. Now I have to “practice what I preach.” I always say…..
– Women can do this on there own. – There are helpful Pilgrims, Cafe owners, Hospitaleros, Clinics, Farmacias. And I AGREE!! It is just that I have grown accustom to my “Camino Life” with David. There are Pros/Cons, Goods/Challenging Parts, Advantages/Disadvantages to Walking the Camino with another person. – The planning and guaranteed company is nice. – If one gets hurt or is very unhappy, then what? During my 15 Mile & 6.5 Hour Walk today I met up with and Walked with some of my Korean friends from the first night at Orisson; TJ & Sun. Sun and I both commented how we love walking and talking. Time goes by faster. Julie, my friend that I had met on the Australian Pilgrims Forum even before our Camino began, saw me as I was starting up the hill to the Pilgrim sculptures. And then I saw the group of Koreans from our first night, and they like EVERYone else, asked me as we passed each other, “Where is David? I said, “His knee hurts. He is going to Leon to a Physical Therapist.” They ALL wish him good recovery! I left Pamplona at 7:30am and I reached the top of the hill,”Alto del Perdon” by 11am. Or, “The Mount of Forgiveness.” It is said, as the pilgrim walks out of Pamplona in Spain, a hill stands on his way, defying him/her, with many giant windmills spread on its peak. It is a very windy place, and a long winding climb. The path is not very steep but feels tiring.. Maybe the weight of unforgiven sins on our shoulders? Once the top of the hill is reached, he is welcomed by these statues representing pilgrims, braving the wind to continue their chosen path. It gives him hope and strength to carry on. Many have passed here before him and many will in the future. As he looks west towards his goal, a splendid view of the hilly region of Navarra stretches to the horizon. I do like the sensation of knowing THOUSANDS have Walked here before me, and THOUSANDS more will continue to do so. To my pleasant surprise at the TOP, I saw Lee-Hwa from our Biarritz Airport Shuttle 6 days ago!! 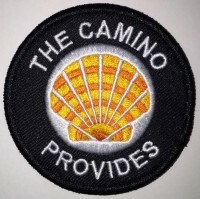 Then Franco, the Italian man I met on Friday that had bought “The Camino Provides” patch created by my Northern California Camiga, Laurie Ferris. And also, many of the smiling friendly Korean women from Orisson, our first night. These surprise sightings are so joyful and fun!! True to form, EVERYone moaned and groaned as we headed down the hill through what felt like a never ending path of River Rocks to Walk over. It ended up being less than 30 minutes, but the unknowing makes it HARDER!! For the remaining 2.5 hours the Camino was on a dirt path surrounded by green fields, trees, hills and yellow canola flowers, for as far as the eye can see. And then, boom, by surprise, a small town would appear right in the middle. My favorite is to have 3+ towns to Walk into & through during every 5 to 6 hour days walk. It breaks it up the day for me, and adds interest, culture and history; with the ancient old buildings, mixed with newer ones. My other favorite has always been to Walk & Talk each day, across Spain. But that is not always possible. David says he can’t Talk & Walk. Others might be talking to someone else. Some Walk slower or faster. I used to be envious of loners, quiet & shy people. People that are happy to walk on their own. Now I can say I am HAPPY with either, with both. In these 5 days of 5+ hours of Walking a Day, I talked intermittently with 10-15 people for 5 to 60 minutes; totaling 1 to 2 hours a day. That left 2-4 hours of just me, my music, the small towns and the beauty around me. I Walk through each town relishing in the experience of children running around, babies in strollers, men and women tending their vegetable garden, teenagers running laughing, others sitting at a Cafe having a drink & chat, etc. All day I look around in amazement as I/we get to Walk across a country on ancient old paths, with yellow arrows pointing the way, Cafes and bathrooms available, inexpensive Lodging, (Albergues/Hostals), culture to experience and history to learn. 1-2-3-4-5 hours go by so easily between all the beauty around, the occasional physical challenges, Pilgrims to talk to and Music to Listen to. I so wish I could describe everything in a way that you could feel it as well as I do. Just as I was entering the last stretch into Puente de la Reina, I saw Olga. She said, “the day hadn’t been complete without seeing me.” Sooooo sweet!! We met the 3rd day as I Walked to Zubiri without David. She and her husband Juan, live near by and they decided, WELL, “HE” decided, he wanted “them” to Walk the Camino. Since they had these days of Easter Week off, they decided to take advantage. Tomorrow will be their last day, until next time. Olga talked all the way down the hill about the Camino challenge, children challenge and how she doesn’t have enough time to exercise. I look forward to hopefully seeing her/them, one more time mañana. – 1000′ incline: Up/Down- Rocks!! I slept fabulously last night in the Dorm Room in the Albergue!!! – I will look for “Private” Alberques that have Dorm Rooms of 6-10 people. – I will also look for Albergues for 20-40 people. Less people, will probably mean, -better WIFI. – I will also look for “new” Albergues. To support them & to relish in the new & clean. Last night at 9pm, I figured out how to go into a dark room of 5 sleeping Pilgrims, and not disturb them, while still being able to do what I needed to do for myself to get ready for bed. Albeit, I got up to go to the bathroom 4-5 times, but that is the norm for me. The gift was, I was able to go right back to sleep.It seemed quiet to me in the room. I think there was one person lightly snoring and a few heavy breathers, but beside that, I never pulled out my earplugs. I turned off my alarm so as to not disturb anyone. And at 6am I heard a bit of movement from others, so I got up. I quietly collected EVERYthing and took it all out of the room, so as to organize without fear of disturbing anyone. Another good Camino adjustment and learning experience. At 8am I stopped to take a photo of the Puente de La Reina BRIDGE. I noticed EVERYone walking over it to leave for Estella. I wonder if anyone took a photo of this iconic Camino location looking towards it?!!? Just as I was walking out of town Lee-Hwa came walking out of her Hostal and said, “Cathy! !” She and I met on our Airport Shuttle when we first arrived on April 10th. We Pilgrims bump into each other randomly and it is always exciting, because we never know when. At 9:45am I heard another, “Cathy!!! It was Sun & TJ & now Clara. She was one of the 10 Koreans from Orisson, our 1st night. She is now walking on her own, as she said, the others were to slow. Then I met a nice young couple walking just one day, from Puente to Estella. They live in Puente but she grew up in Estella. At age 35, this is her first time walking this 14 mile piece of the Camino between these two cities. It was a curiosity to her. There were a lot of Inclines, and huffing and puffing. At 10:45am as I was walking into Lorca, the 3rd town, I met Hannah and Sophi (in their 20s) from Germany/Brussels. It turns out that Hannah had a boyfriend from Guanajuato, Mexico near where I lived for 7 years. I wonder if my goddaughter, Astrid went to school with him, as she studied in Germany as well. Small world!! As I was walking thru and out of Lorca Eva & Sara came out of the Cafe. I had met them on my way to Pamplona 3 days ago. At that point they didn’t know my name, only that I was from California. So when I took a wrong turn they called out waving their arms, “California! !” EVERYone helps EVERYone here, on the Camino. Minutes later, Juan, of Juan & Olga spotted me, “Cathy! !” Today is their last day as Semana Santa días de Fiesta have come to an end ((Easter week). We came upon the couple I had met earlier that were walking just for one day, between their towns; Puente to Estella. I introduced them. They ended up walking & talking for 2 hours towards Estella. Fun!! All 5 of us, together-ish. It took 5 hours to walk to Estella today. I arrived at 1pm. Today I got to Walk though 4 towns in my 5 hours and 14 miles. Each town pops up like a surprise as we walk through beautiful green fields if barley and wheat. Each little town offers all Pilgrim services;. Food, Lodging, Cafes. Some are small cities with Farmacias. Supermercados, Stores, etc. Yesterday, while walking UP the HILL into the town of Obanos, Daniella, a young adorable Italian women, that I met on the deck at Orisson the first night, came walking up, very happy that we could see each other again. I noticed this time she was with a handsome Spanish Pilgrim, and it looked Ike’s like a new boyfriend as they kissed. Love happens on the Camino!! I do want to say that in my observation and opinion the Camino can be broken up into parts. If a person has less time, less money, less physical energy to walk 30-40-50 days, I would love to help strategize 2 weeks; from leaving & returning home, or 3 weeks, etc. I know the path so well now, that I can present a “partial Camino.” MANY Europeans do just that and they are happy they that they did. And often come back time and time again, to walk the next piece. I love being here. I love walking. I love being outside. I love the freedom of time to be able to wonder around these ancient towns in the afternoon. I love meeting & being with all of these interesting people; Pilgrims, Hospitalarios (Albergue owners, etc), store owners, locals. I love paying only 10 to 20 euros to have a clean & nice place to sleep. Today I needed to wait until the “Orange Mobile Phone Store” opened at 9:30am. – €43 for a Phone, that includes €20 worth of 250 minutes to Call ALL over Spain. I can even change the SIM card and use it when I travel to other countries. I adored my Hostal/Albergue **Hostal Agora** in ESTELLA. The owners, the WIFI, the newness, the individual private beds with curtains, the male/female separate showers/toilets, the delicious breakfast, the great central location!! I walked for 5.5 hours today; 10:30 to 4pm. I walked on my own for the first 4 hours but all throughout the day, I would turn a corner, walk down a hill or into a town, and see a Pilgrim I knew. Each time we chatted for awhile and then we said, “Buen Camino,” as we parted. How fun is that, as one walks across Spain!! – At 10:30am as I was walking up the hill out of Estella, sitting on a bench, rubbing her feet, was GINA from Malaysia who lives in England. I hadn’t seen her since from 1st in Orisson, on 4/12. – At the Irache Winery, where there is a free faucet of Wine or Water, I saw daughter GISELLE and mum PENELOPE, again from the first night but also many times since. – Of course I saw the KOREAN GROUP as they were snacking on picnic benches. Then the Jacksonville couple, my age, VANCE & HELEN, that I had met 2 nights ago. – KHRISTEENA from CAMIGAS was sitting on a bench, as I was walking up a hill. She called out, “Are you Cathy?” and “How is David?” We had met in March on the FB CAMIGAS Forum and had messaged back and forth A LOT to each other. Such a joy to be able to Walk the Camino “solita” and to NOT feel ALONE. At soooooo many twists and turns, we see another friendly Pilgrim. – At 12:45pm As I was walking out of Villamayor de Monjardiin there was CAROLE from Quebec, again from Orisson on 4/12 and whom I have had the pleasure of running into numerous times since. She too, as did everyone else above, ask…..
At 2pm I welcomed seeing the Food and Drink Truck with tables and chairs to rest at, that I had remembered. The owner is JORGE had walked the Camino twice. He also lived in Mexico for a number of years. He helped me figure how to use my phone to call David. People help us all along the way. – I saw for the first time since last Thursday, MOMIE, from Scotland. We talked all the way to Los Arcos. Those 1.5 hours went fast. Now I am ready to go visit her and walk in Scotland. I am in Albergue Casa de la Abuela, where I return each year. IOSU and SARA are the owners. We HUG when we see each other. It makes me happy. I love Walking the Camino. I love coming back again and again each April and May. This is my 3rd time coming to Walk the Camino. 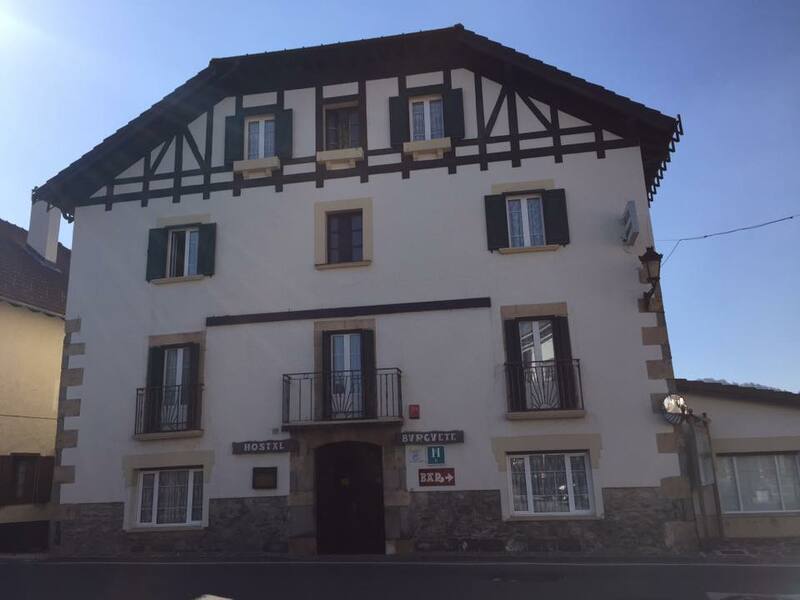 – April 2015: David and I slept in a DormRoom/Bunkbed for the first 4 nights; Orisson, Roncesvalles, Zubiri & Pamplona. From Puente de la Reina on David realized he could look for Private Room accommodations. Being a self proclaimed “loaner” being in a Private Room was/is much more desirable to him. – Now that David is in León recuperating, I am staying in Dorm Rooms. My favorite are Rooms with 4 Bunkbeds or less. -Last night there was me, 2 Canadians, 3 South Koreans. The 3 South Koreans had alarms going off at 5am. This is the norm for them. Then it was like a tornado of movement, sounds and ?!?! It was hysterical to me. I figured I might as well get up, and so did the Canadian man. The Canadian woman tried to go back to sleep. None of us were angry. Just amazed and curious. Crazy!!! If someone REALLY needs to get a certain amount of hours of sleep at night, on The Camino in DormRooms, they are going to be gravely disappointed. I left my Albergue at 7am. The light was spectacular!! I have been asked why I/we keep returning to the Camino year after year. Others return to their Mountain Cabin, visit College Friends, go to their Summer House, go on a yearly Cruise, etc year after year. Those are VERY nice things to do. What I like is walking, and moving my body, plus, seeing & experiencing new and different, along with, old and familiar. I love people, and people of all ages, and nationalities. I love the oldness I get to experience in many of these medieval towns & cities. I love the green, the landscape beauty all around me as I walk. I love moving forward towards a common goal. 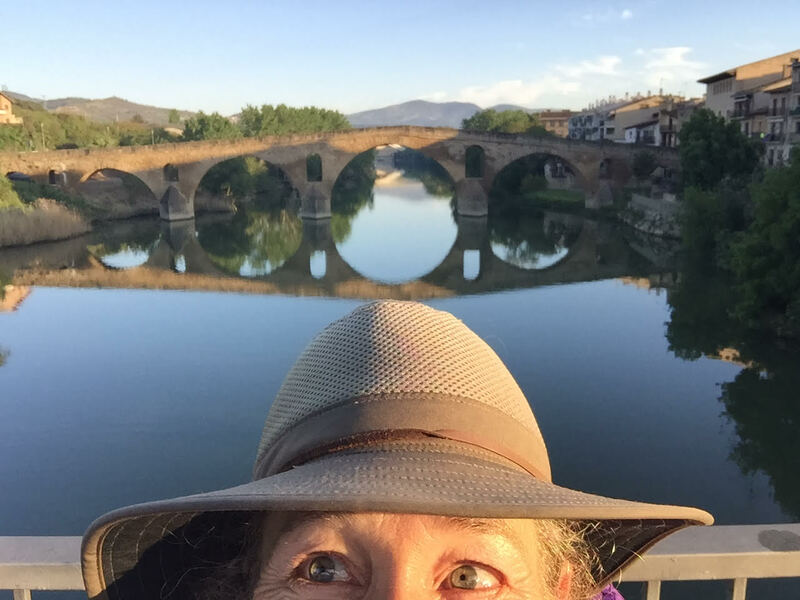 I have also been asked “Why” I/we keep returning to the Camino “Frances,” instead of El Norte, Portuguese, etc, as we are on the Camino Frances for our 3rd time. – I like the people, and on the CF, there are MORE people than the other paths. – Last year we enjoyed the familiar, and also the new and different. We like the combination of comfortably familiar & the variety of things new. – I like the lenght of it; 50 days. 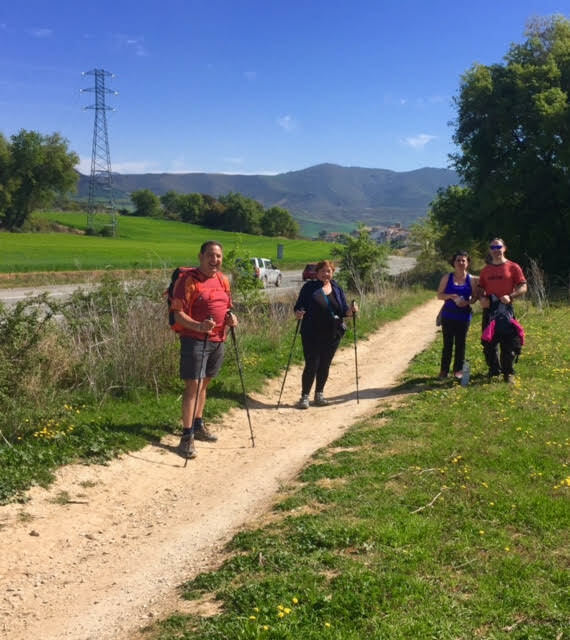 Many of my Pilgrim friends that I have mentioned in the last 7 days Walked 10 Kilometers further than me today to “Logroño.” This is where our first group will begin to separate out and move ahead. Many Pilgrims want to or need to be in Santiago between May 15-20. I plan to get there about May 24. So for now on, they need to Walk 25-30 Kilometers a day. I like to walk 18-22 Kilometers a day. When I ask a Pilgrim what date they want/need to be in Santiago, I am aware of if I might see them again off and on. After 1.5 hours of walking, I stopped in Sansol, the first town out of Viana. I needed to use the bathroom so first I asked about a Cafe con Leche, and then the Baño. I always buy something; fruit or a drink, if I need to use the bathroom. The owner, Asier, was soooooo nice to me. He taught me more how to use my new “old school” mobile phone. He helped me leave an “outgoing message” in case David or an Alberque calls me. He explained to me how 15 years ago the Camino Confraternity re-routed many of the paths to go thru the towns; GOOD for the Pilgrims. GOOD for the town’s businesses. Candy & Sue from last night’s Albergue came in while I was there. They were struggling to unlock the door of the Albergue last night and I let them in, as they were giggling. They are friends since childhood, reuniting to walk together. At 9:30am as I was leaving Sansol I saw Hannah from Denmark and also the Scout Group from last night. Hannah and I walked and talked for awhile, until she stopped to take photos of the beautiful landscape. At 10:30am I came upon a French mom & dad, and an adult sister & brother. They are Walking for 7 days together. I had the joy and pleasure of walking with Fred (son) and Stan (dad) the last hour into Viana. In Viana I went to the Correo Office and sent ahead 3 kilos. My pack is 4 to 5 kilos now. VERY reasonable!! It only cost €12. The Albergue had many rooms. My room had 4 BunkBeds but we only had 6 women. It was great!! Julie from Australia, Momie from Scotland, Sue from Korea, Denise from Germany, Linda from Sweden. It was a sweet and GREAT group. The French Parents, Daughter & Son were staying there. Plus, Diana from Holland. I had dinner at the Albergue with Jim from London, Hank from the Netherlands, Virginia & Brian from Austin and Conrad from Holland and Linda from Sweden. I love meeting and visiting with such interesting and Camino kindred spirit people. I am a HAPPY Pilgrim. Sleeping in a Dorm Room with ALL women, I sleep soooooo soundly. Better than at home. A very curious and interesting phenomenon. Sometimes I feel like a turtle with my backpack snugly against my back. (Now my backpack is 5 kilos since I emptied out, and sent forward 3 kilos yesterday) I tuck my poles away and walk briskly when it is flat. It is fun!! And crazy to think I am walking ACROSS a country, one day at a time. Today I walked off and on by myself and with ……. Since my first Camino Frances in April 2015, I have a running list of awesome Walks in MANY different places of the world. At the same time I now want to visit my friends in Scotland, Holland, Australia again, etc. Oh, sooooo many places go and people to see and visit and Walk & Bike with. When I walk into or through big cities, for example, Logroño today, I often ask for directions. We don’t need to speak Spanish. Just say with a questioning voice and the people will point. …..
Today I stayed in Navarette, in Casa del Peregrino, where David & I have stayed the past 2 years; April 2015 & 2016. Angel, the owner & hospitelero and I were HAPPY to see each other again. Recently he had messaged me a photo of himself in front of the Cathedral de Santiago, completing his 3rd Camino!! His English is better and better each year. His mama y papa were there this time to greet Pilgrims as they arrived. So sweet and loving!! They kept saying, “This is your house. Do you want something to drink?” Angel even gave me a little present of a shell necklace and pin. I will wear them with love. A few Pilgrim friends were at the same Albergue and MANY more were in town at the Bar Deportivo with a large outside patio, right below the church. Begoña & Antonio, the owners make EXCELLENT Tapas!! Navarette is a REALLY nice town for Pilgrims to hangout and visit, all together. Similar to Los Arcos. After going to the Supermercado to get food for my Lettuce Wraps, etc, I walked with Momie to the same Farmacia Shellie and I went to last year. Mary, the daughter of the husband and wife owners was soooooo kind and helpful. I find the people in the Farmacias to be excellent. They are often Pharmacists and always VERY experienced with a Pilgrim’s needs. Plus, speak enough English to help. I suggest to speak SLOWLY, enunciating and separating EACH word CLEARLY. – I use simple basic English and NO slang. Buen Camino to YOU all!! PS: If you have a question or comment, FB Message me. I have 272+ emails and I don’t get to them as fast. My 3rd time staying in Viana with Sonia in Alberque Izar. My bed has the Camel Blankets with the Silk Sleep Sack inside. I only have a single Silk Sleep Sack, while others have Sleeping Bags. I use it with 1-2 Blankets that are supplied at the Private Alberques. It is the size of a pear, and light!! I have been asked if a Sleeping Bag is necessary. I am fine with the Silk Sleep Sack, because I do not want to carry a Sleeping Bag. If I am cold, i wear all of my clothes and my light jacket. I said goodbye to 35 year old Linda from Sweden as she needed to start walking more Kilometers a day, than me, to get to Santiago by May 15. I don’t expect to get there till May 24-ish. While packing up in the dinning kitchen area a man and wife from New Hampshire looked at me and said, “Is your last name Diaz?” This was a couple my age (64), Doug and Kay from New Hampshire. He recognized me once I put on my hat, from the APOC Forum I have been Posting on. -American Pilgrims on the Camino. This my 2nd “On the Camino” APOC connection. It thrills me. I love APOC, for all the information we can glean and for all the support & love everyone shares. “YES, you are right!! I am a HAPPY traveler! !” I don’t think of myself as an “adventurer” but I guess maybe I am. At 7:30am I started out with my 60 year old Camino friend from Scotland, Momie. We met the first night in Orisson 10 days ago. Within 15 minutes we parted and I met 2 french women my age. They are Walking the Camino in sections each year. There husbands drive and meet them each night. At 9am I found myself happily walking into Ventosa, a nice Cafe with an awesome bathroom. I purchased my Apple, and then asked if I could use the bathroom. I met 40 year old, Malikee from Dublin, who now lives in NY, and does a lot of work in Philadelphia, where I grew up. He is walking the Camino with 2 friends from Spain & Denmark, a piece at a time over the course of 3 years. He said, “Children, Wife, Work don’t allow ALL at once.” This method is VERY European. I enjoy each persons stories, plans and experiences. EVERY time I stop it is like a Reunion and Surprise to see who is there or who is walking in. – I re-met a Holland couple my age, that I had met 2 days ago in Los Arcos: Lynn & Anton. They have 2 weeks to walk. They will stop in Burgos on Wednesday 4/26. That is the same Date I probably will be in Burgos. The only reason I know this is because I have in my Notes on my iPhone; where we walked to in 2015 & 2016; EVERY day’s Start/Stop, Miles, etc. If you would like a copy, FB Message me. Over the past 2 Caminos, David has done an AMAZING job of counting out the distances in Kilometers that are in our John Brierley Camino guide book, and than translating them into miles. We are most comfortable Walking 12-14 miles and 8 miles on a few “rest days.” So I pretty much know which towns/distances I feel BEST walking to. Again…. “IF you WOULD LIKE this LIST, FB Message me. AT the Cafe, OR walking up to it I got to see ….. I am walking in the Rioja Wine Region, “the Napa Valley” of Spain. This might be how I can convince my daughter-in-laws to join me with their hubbies, my sons. People say it is DELICIOUS Wine. – Becca? Emma? My treat!! You and Granddaddy David can Taxi, eat Tapas, Drink GREAT Wine and Marshall, Derrick and grandchildren can Walk with me or Taxi. I have been asked about Vegetarian, Gluten Free, Sugar Free, Kosher. – I eat Vegetables, Meat & Dairy. – I buy most of my Food in Supermercados/Fruterias. – I eat pretty much the same thing every day and I am happy & fine. I think ALL preferences can be accommodated if one is willing to buy their own food and eat it as is, or cook something when a kitchen is available. My food/eating looks like this……. Occasionally I will opt to join others and have a Pilgrim’s Meal. Which is €10-12 euros for a 3 course meal. By 11am I found myself walking with Virginia & Brian, that I met 2 nights ago in Viana. They are a newly retired couple from Austin, Texas. We talked about the the Camino, our travels; past & future. I love chatting with Camino people, fellow Pilgrims. We are such Kindred Spirits. They told me about “Wayo Tanzania Walking Safari.” They said they saw Herds of the Big 5 animals and the Little 5. David and I plan to go to Africa, his last & 7th Continent to visit!! If anyone uses the “squatty potty,” while Walking the Camino, FB Message me. I have some ideas, for adaptations. – Eugene & Gretchen another newly retired couple from Mendocino, CA. The Albergue had 3 long picnic tables as a dining room and a big kitchen. I made a delicious Pot of Veggie Soup with canned Calms and Oatmeal to thicken it. My newest Camino invention. Many of us sat around the tables making plans for our next days Walks, discussing Distance, Accommodations, etc. Plus, blisters, foot pain, and about our families. Most went down the street to a Bar/Cafe to get Pilgrim’s meal. I ate my delicious thick flavorful Vegetable Clam Soup invention. I shared it with Eugene & Gretchen from California. My Lettuce, Turkey, Cheese Wrap. Momie arriving to our first stop for the day in Ventosa, just after Navarette. My sister asked a few days ago how I feel Walking “on my own,” alone, because she knows I feel lonely when I “travel alone.” But this is different than “regular travel.” I do not “feel alone.” I actually feel “independent” -strong and happy. I used to prefer to walk with other Pilgrims, and I would search them out. Now I actually really like having hours on my own. At the same time, if I come upon a Pilgrim or one comes up behind me, I am HAPPY to chat and get to know them!! I learn so much; about them, their travels, other Walks, Walking Safaris, their Camino experiences, etc. It is FUN for me. David & I spoke today on our handy dandy “old school” Móvil Phone that we bought at the “Orange Móvil Phone Store.” It only cost €40 euros for the Phone & 250 minutes of Calling in Spain. 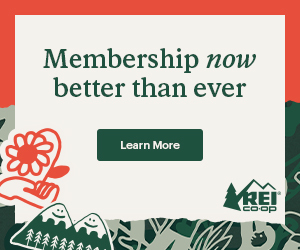 We can Re-Charge it with Minutes at Supermercados, Tobacco Stores, etc. We can use it when we Travel to other Counties, just by Changing the SIM Card. This works GREAT for me, with my iPhone for EVERYthing else. David will take a Bus to “Burgos” as I plan to be Walking into Burgos on Tuesday. He, even a self proclaimed “loaner,” is bored sitting around in Leon for the past 7+ days. He has walked around the Old City numerous times, as well as been to the Cathedral, Museums and Basilica, etc. And reading TONS!! He will bus from town to town or walk some and taxi if needed, as I continue to Walk. He said he would rather do that, than go home. He would only go home if he thought he needed surgery. Yea, “We” will be “On the Camino” again. – 18-28+ years old, in between, school, work and other life requirements. – 30-45 year olds, NEEDing the Camino to help them in life, and taking 14-30+ days to get away and sort it out. – 18-80+ year olds, that Walk 1-2-3 weeks whenever they can make the time. Typical of many Europeans, but also Americans, etc. – 55-80+ year olds, Retired and with Time to choose. At 8:30am on the top of a hill I met Bernhard from Germany, a man my age, resting on a cement stump. I had seen him in the Alberque last night but we hadn’t talked. – Where will you Walk to today? – My name is Cathy. – Where did you start the Camino? – Do you Plan to Walk to Santiago? We had a sweet 5 minute conversation about those things, his past Caminos, our experiences of Walking to Roncesvalles; thru the STEEP Rocky Woods or down the Path. We both did the STEEP Rocky Woods the first Camino. We both walked to the RIGHT down the Path; much more doable our 2nd Camino!! He said he planned on Walking through Santo Domingo, where many/most Pilgrims choose to stay, and continuing on for 4 more Kilometers to the small town of Grañon, and where I also plan to sleep. We bid each other farewell with the traditional; “Buen Camino” and a big SMILE!! I love chatting with Pilgrims!! The commonality we all feel about the Camino experience is heartfelt and special. I believe it is this “Kindred Spirit Camino Community Experience” (and other things) that keeps us Pilgrims returning, while our family and friends look at us with curiosity and confusion. Today I Walked through the small town of Cirueña. It seems to be a community grown out of a big beautiful Golf Course. Maybe a weekend Resort area for local Spaniards. I have been asked about “My Hair” on The Camino because it is Long & Curly. I, like most women, think about these things as I/we plan our Camino, our supplies, etc. It doesn’t matter if we have long/short, curly/straight hair. I met Diana from Holland on Day 3 walking to Zubiri. The topic of our Hair and Walking the Camino came up. She said she had to Let Go of bringing a Blow Dryer for her Hair every day. She said, therefore her FIRST and most important purchase was her Hat. I have seen her Off and On over the last 8 days, and ALWAYS with her cute Hat!! Picture perfect. – Big enough to fit ALL my hair in, when I get warm, usually by 8:30am. – Decent enough for Photos. And as you can notice, MOST photos are with my Hat on, to hide wrinkles, sun spots, etc. And about the thick long CURLS!! – I go to Rogelia Munoz my AWESOME Hair Dresser in Watsonville, CA and she Wash & Blow Dries my hair before my Camino. Since my hair is so thick & dry, I can go an embarrassingly long time without washing it. But in a few days you will see photos of bushy curls, when my not tucked/quished into my Hat. I was talking with some Pilgrims today about the unique experience of seeing the town or city you/I plan to stay in, and the LENGTH & TIME it takes to get INTO & THRU the City to the Old Medieval sections with the Cathedral or Church and the Albergues, Hostals, Pensiones. It can take 1-2-3 hours depending on the City. At 10:30am, after 2.5 hours Walking alone…..
– I saw newly retired Virginia & Brian from Austin, Texas, walking into Santo Domingo. – And there at the entrance to the Old Medieval area, I saw 25 year old Maddy from last night. At 11:30am I bid them both “Buen Camino” and I walked on to Grañon, while Maddy stopped at a Bar/Cafe for a Tortilla con Papas -Potato Omelette & Momie took a Taxi to let her feet heal from Blisters. I had 2 large Red Bell Peppers & an Apple to eat as I Walked. All in all, I walked the 6 hours from Azofra to Grañon (past Santo Domingo) by myself, minus a few minutes with Virginia & Brian entering SD, and with Maddy & Momie while in SD. In Grañon I met new Pilgrim friends…..
We are ALWAYS sooooooo HAPPY to re-see each other & check in on how we have been. I wear these long Gloves for warmth. My Silk Sack is easy to get in and out of 5 times a night to go to the Bathroom. “Are we there yet?” Walking into Santo Domingo. At 6am Momie, Maddy and I got up. We were in a sweet room with 2 BunkBeds, 4 beds, but only the 3 of us in the room. The rest of this sweet new Alberque in Grañon had 2 other rooms with 3 BunkBeds in them. Manu & Sara are the owners. They proudly told me about their own Camino experience. As soon as Momi and I walked in when it opened at 1:30pm, Sara said with pride, “I am a Pilgrim.” The Cost of our Bed was €10 euros. She offered us to choose if we wanted to have a Homemade Dinner for €7 euros and Breakfast for €3 euros. I told her I only eat Meat, Fruit, Vegetables; no Wheat or anything Milled, even if Gluten Free. Nor Wine, and not any Sweeteners; Sugar, Honey, etc. She told me the Menu and said I can have many Bowls of the Potato Vegetable Chorizo Soup & Salad and skip the Pasta, Bread & Wine. The dinner was DELICIOUS and enjoyable to sit, eat and talk with 6 Pilgrims from 6 different countries. The languages we used were English and some Spanish. English is the most used language on the Camino by most nationalities. I left a bit before 7:30am. Momi, Maddy and others were still readying to leave, while a few had already left. Today was Sunday so NO Supermercados, Fruterías, Farmacias, Stores are open. But I did notice that as I walked through the 5 small Towns, a few Bars/Cafes were open to serve the Pilgrims Walking by. As a Pilgrim was passing me, I asked him, “Where are you from?” He said, “Czech Republic.” I said, “My name is -Seitchik.” He looked at me inquisitively and then he re-said it with his Czech pronunciation. I smiled and said, “Yes!” I said, “My great grandparents are from this area.” He said, “No English.” I asked, “Español?” He shook his head, “No.” I smiled and said, “Okay, Buen Camino,” and he walked ahead. At 10:30am as I was Walking into Belorado, where David and I stayed the last 2 years I saw 2 German Pilgrim friends (40 & 70 yrs old) taking a rest on a stomp, with a bit of a snack. They were friends I met yesterday. Jeff and I walked to Tosantos, the next town, together. It made the last 2 hours go SO fast!! I couldn’t find the Alberque. A 4 foot high grandmother came out of her house and showed me where it was. I find the elderly locals very caring and helpful to Pilgrims. After walking 5.5 hours, at 1pm I walked into my nice small Albergue; 1 room with 8 Bunkbeds. Bathrooms and a Cafe/Bar for Locals and Pilgrims & 2 beautiful Gardens with Tables, Chairs & Umbrellas for shade. Plus, visiting from the Municipal Albergue: Leticia & Marcio from Brazil. Maddy, Momie and I walked up to a Medieval Hermitage built into the mountain. Each Camino, I experience new and interesting things. – BOTTLES of Wine & Water. We were 13 eating together! Talking together, sharing Camino plans and experiences together. My love of Koreans, Germans, Australians, etc GROWS every Camino. At dinner there were people from …. – 5 Korea, 3 Germany, 2 Scotland, 1 U.S., 1 Franch, 2 Australia. I am definitely in my HAPPY place. Cathy Seitchik Diaz April 24 · Leaving Tosantos towards Belorado. I love these 7am skinny shadow photos. As the day goes by, my shadow gets shorter and thicker. Pointing to the Card I gave Pilar last year. Leaving another Card this year. My 4 foot tall “grandma angel” to the left with her friends that showed up while she was helping me.